On This Day…19 September | What I think About When I Think About Writing. Today is the biggest day of the Irish sporting calender: All-Ireland Senior Football Final day in Croke Park. The Rebels of Cork take on the Mourne Men of Down in what should be a cracker of a match at GAA headquarters. Grannies will be sold for a ticket! My head says Cork will win; my heart says Down will shade it. We’ll see who’s right tomorrow. I shall report then. 1870 – Having invaded the Papal States a week earlier, the Italian Army lays siege to Rome, entering the city the next day, after which the Pope described himself as a Prisoner in the Vatican. He only recently escaped and was last seen in Birmingham. 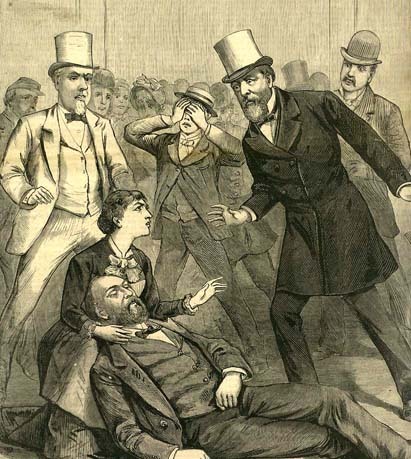 1881 – President James A. Garfield dies of wounds suffered in a July 2 shooting. He hung around for while, didn’t he? 1900 – Butch Cassidy and the Sundance Kid commit their first robbery together, while raindrops kept falling on their heads. 1945 – Lord Haw Haw (William Joyce) is sentenced to death in London. I bet he wasn’t laughing then. 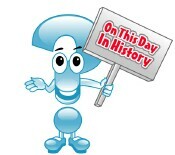 1970 – The first Glastonbury Festival is held at Michael Eavis’s farm in Glastonbury, United Kingdom. 1985 – Tipper Gore and other political wives form the Parents Music Resource Center as Frank Zappa and other musicians testify at U.S. Congressional hearings on obscenity in rock music. 1933 – David McCallum, Scottish actor and star of The Man from UNCLE, Sapphire and Steel, and N.C.I.S., 77. 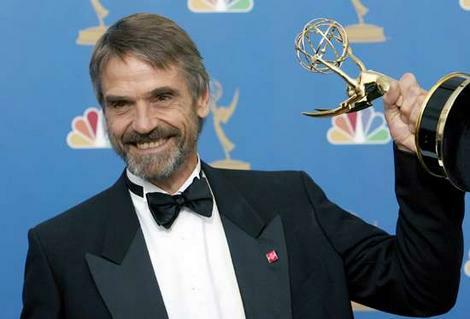 1948 – Jeremy Irons, English actor and Oscar-winner for Reversal of Fortune, 62. 1963 – Jarvis Cocker, English musician and singer with British band Pulp, 47. This entry was posted in On This Day and tagged All-Ireland Senior Football Championship, Arts and Entertainment, Birmingham, Cork, Cork City, Cork GAA, Croke Park, David McCallum, Frank Zappa, Glastonbury, Glastonbury Festival, Ireland, Jarvis Cocker, London, Michael Eavis, Music, Papal States, PapalStates, Pope, Pulp, Rome, Sports, United States, Vatican City, William Joyce. Bookmark the permalink. I hope your team win, aardie, have a good Sunday. I have two Grannys. Does that mean I can have two tickets? Hoping fervently you have already done the deal and got the tickets in the bag. I love football because you can just stand and shout obscenities really very loud and no-one takes a blind bit of notice. Wish you could have been here this afternoon to see/hear me laugh over your post today – but maybe you did – it woke my husband up! Anyway, when I read the two team names – the first one I got, the second I read as – Mourne Men of Down In What Should Be a Cracker of a Match at GAA Headquarters. What a name for a team! I have of course heard of “Down in the mouth, but never have I heard of Down IWSBACOAAMAGH! (I know I added the caps, but that’s how I read it, after seeing the Down. . .). Just shows you how ueful even an unnecessary comma can be! So, when I finally got that the Mourne men were only of Down, and not the rest of it, I see that Grannies are to be sold for a ticket! Having just become a Granny for the first time last week, I could have taken offense – however, noting that the tickets appear quite valuable, I understand that at least women of my ilk are not being sold cheap! Is the American version of your Irish “Grannies will be sold for a ticket” translated as “Grannies let in free with each paid admissiion,” or am I totally offbase, and it means that some other item comes free (a food or drink item, perhaps) with each paid admission. I must admit to a rather vivid imagination – I am conjuring up a picture of a rather nefarious looking gang of hooligans standing by a large truck, full of grandmothers, and they are grabbed off one by one and tossed to children, standing in line who want a Granny. They have no money, but they each just happen to have a tournament ticket, so their dreams are answered – Sold! One Granny per ticket – no refunds, sorry! And to think that we both speak the same language! Or do we? Thanks for the wonderful laugh! Maybe not intended by you, and the laughter is at my own American expense, and not at yours – but a great laugh just the same!